Poor mobile shopping experiences are stopping transactions in their tracks - Here’s why retailers need to optimise websites for the mobile generation. Mobile commerce - the process of shopping through a mobile device (typically a smartphone) - will continue to alter consumer shopping habits for a few years to come. Although the majority of mobile buying still occurs on tablets today (this year, £15.8 billion will be spent on tablets, representing more than 62 per cent of total m-commerce sales), it's expected that by 2020 smartphones will dominate m-commerce and account for 52 per cent of mobile transactions and £22.1 billion in sales according to E-commerce news. While smartphones are already responsible for driving significant amounts of traffic to retailer sites, with a reported four in ten (39 per cent) eCommerce transactions now involving multiple devices along the path to purchase, it is the sheer volume of smartphones owned (UK smartphone penetration grew 7 per cent in 2016 to 81 per cent and technological advances which make mobile shopping easier that will lead the transition from e-commerce to mobile-commerce. Despite the potential, one overwhelming factor has prevented this shift from happening sooner: the mobile shopping experience is still pretty terrible. Many factors contribute to a poor mobile shopping experience, not least the fact that few retailers have optimised their ecommerce websites for m-commerce or have a transactional mobile app. According to Internet Advertising Bureau, (March 2015) 64 per cent of the top UK retailers have a transactional mobile site, while only 32 per cent had a transactional app. And even when they do, consumers are still quick to judge. One Adobe study found that only 45 per cent of consumers are satisfied with retail applications and 47 per cent are satisfied with retail mobile Web sites. 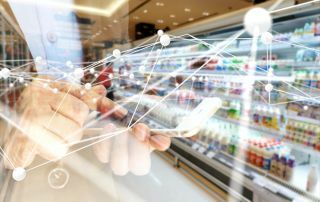 Worse yet, according to Forrester, 55 per cent of consumers will delete a retailer's mobile app if it fails to meet their expectations within the first few engagements. Not investing in mobile can also have significant impact on one of the holy grails of ecommerce success - Search Engine Optimisation (SEO). As of November 2016, Google started rolling-out Mobile-first indexing (often referred to as "mobilegeddon"). This means Google will primarily use the mobile version of a site’s content to rank pages from that site. Obviously, m-commerce is becoming the norm. And since optimising the mobile experience is important for both search engine rank and onsite conversion, retailers who fail to normalise will pay a price. Poor mobile site design, network latency, lack of trust transacting via mobile and limited screen real estate are all holding m-commerce back. Thankfully, some companies are working to address these problems. Today, 60 per cent of retailers in the UK have already adopted mobile channels and a survey of 100 UK top e-commerce executives revealed that 80 per cent of them will be allocating at least 21 per cent of their digital budget to m-commerce over the next 12 months. Beyond design and checkout, many retailers also acknowledge the critical role onsite-search plays in optimising the mobile shopping experience. According to one US Study, 4 out of 5 smartphone users use retailer apps, with 47 per cent of them using the app for product search. Upon closer examination of the issue, it's easy to see that many of the things that have held m-commerce back over the years, namely limited screen real estate, network latency and impatient shoppers, are the same as those which put onsite product search at the forefront of the m-commerce experience. The search box has never really been centre stage in e-commerce, but in m-commerce it's the opening act. While most retailers circumvent poor product search on desktop by improving category navigation, filters and product recommendations, the same workarounds are much less successful on mobile. The mobile shopper expects retailers to remove pain-points from their lives and add value in the form of convenience. Mobile shoppers expect short, effective content that can be quickly and easily consumed. And as their confidence with mobile grows, so does the sophistication of their expectations. Product search, if done correctly, can meet those expectations. Within just a few keystrokes or even a voice command, search can deliver a relevant and personalised list of products the shopper is actually looking for, which significantly shortens their path to purchase. Those search results can even reflect the unique context of the user - taking into account time and location. Instead of endlessly scrolling through pages of irrelevant search results or, worse yet, attempting to click on a series of sub-category navigations and filters, shoppers can be given a short list of relevant search results that match their intent - regardless of the taxonomy used or the spelling mistakes that often result from chubby thumbs typing on small keyboards. Some leading retailers, such as Bubbleroom, put a great deal of focus on their mobile search experience. In the last two years Bubbleroom's mobile traffic has grown nearly 40 per cent and now makes up the vast majority of their online traffic. What sparked Bubbleroom's investment in better product search was discovering that their mobile shopper is 30 per cent more likely to use site-search than a desktop visitor. Moreover, the mobile visitor who searches converts at twice the rate of a mobile visitor without search. It was clear to them that site-search had the potential to either greatly improve m-commerce or greatly deteriorate it. After investing in a 3rd party search software and within only a few months, Bubbleroom achieved a 72 per cent revenue growth among mobile visits with search. While better, more relevant, site-search is hardly the end-game for improving m-commerce, it's definitely a major step along the way and a critical component of m-commerce success. But it can't be done in isolation. Better product search goes hand-in-hand with improved User Experience (UX), website/app speed and a seamless checkout. Basically, if a retailer does not have a mobile app or mobile optimised site, response times below two seconds, and does not offer one-click checkout, any investments made in product search will be undermined. So, when it comes to m-commerce, product search may be the opening act, but it isn't a one person show. If retailers refuse to focus on optimising their websites and fail to understand the many pain-points of consumers, ultimately, they will fail to keep up with their competitors. They must understand that m-commerce (in all its forms) isn’t a luxury, but a necessity for the mobile generation which is only predicted to grow and change in the years to come.